• Good hard-working men and women from around the world have been slogging away in harsh conditions deep in the Sahara, helping to secure the world’s energy reserves at the natural gas complex in Algeria. • Despite the best efforts of all nations participating in the global war on terror, the attempt to contain militants linked to al-Qaida had failed. A group of terrorists was able to storm the Ain Amenas gas complex and take a large number of hostages. • In order to stop the terrorists from escaping and disappearing into the Sahara, Algerian forces attacked the gas complex, resulting in the death of more than 30 hostages and at least 20 militants. • The US has had its hands tied in combating the rise of extremist militants in the region because few nations have been prepared to admit US forces onto their soil because of fears of loss of sovereignty. But is there more to the story? Heartbreaking experience shows that we need to have our hypocrisy antennae fully extended and tuned whenever the war on terror is involved. 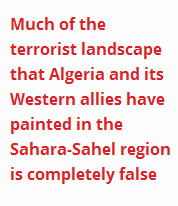 Readers of the New Internationalist magazine had a very timely primer on alternative interpretations of the Algerian gas complex siege though the shocking background piece How the US has been sponsoring terrorism in the Sahara by Jeremy Keenan in the December 2012 issue of the magazine. Keenan described how “terrorism was being fabricated and orchestrated in the Sahara-Sahel by the Algerian DRS [the Algerian intelligence service], with the knowledge of the US and other Western powers”. Jeremy Keenan’s new book The Dying Sahara is to be published in March 2013. In an earlier book – The Dark Sahara (Pluto 2009) – Keenan set out the appalling reasoning behind the joint need of the US and Algerian administrations for more, not less terrorism. The Algerians were keen to promote terrorism to demonstrate their need to modernize and increase their stash of weapons. The US administration saw increased terrorism as a justification for opening a new Saharan front in the war on terror. That in turn would “legitimize America’s increased militarization of Africa so as better to secure the continent’s natural resources”. Keenan cites the 2003 kidnap of European tourists in the Algerian Sahara as an early example of US-Algerian deliberate incitement of terrorism, claiming that the attack was actually ordered by an Algerian DRS infiltrator, Amari Saifi (El Para). Soon El Para was referred to as the Sahara’s Bin Laden, a hypocritical attempt to turn a story of deep intrigue and misinformation into a promotional headline for the war on terror. Keenan’s analysis is a timely reminder that we need to prioritize our support for independent media, to balance out the hysterical and hypocritical “goodies and baddies” superficiality of mainstream reporting on the war on terror. With corporations and countries from Asia, Europe and the Americas all positioning themselves to secure and exploit Africa’s resources, we’ll need to keep our hypocrisy antennae very well maintained. This entry was posted in Militarization and tagged Africa, Algeria, militarization, politics, war on terror by Brian Loffler. Bookmark the permalink.